Devils dance throughout the mining zone of the altiplano and into its cities in memory, if nothing else, of the Tío, the supay, the figure that controls wealth and safety in the mines. 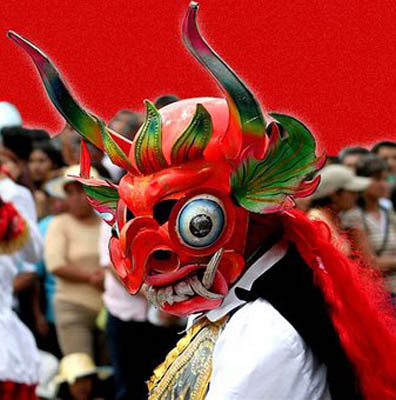 Mixed with the Christian devil, this ancient figure of fertility and humidity, comes out of the earth to organize comparsas, dance troupes, and to dance with aggression and energy through streets and in stadiums. 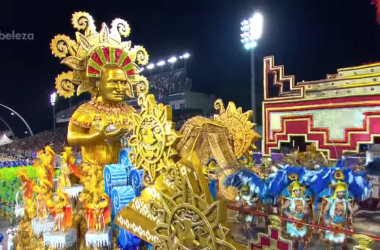 There he joins another ancient figure, the Moreno, the dark one who with wide, rounded costume and colored feathers stabbing the sky weaves in a mass of similar figures from mountains through streets and into stadiums. 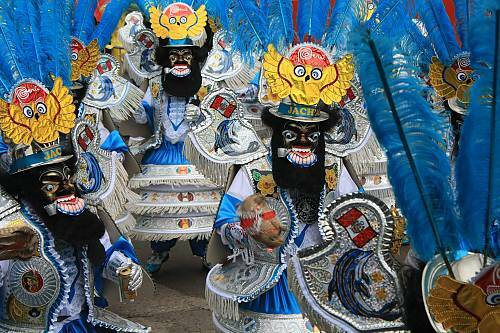 The common explanation of the Morenada, the dance of the Morenos, is that it satirizes and remembers the African slaves who came with the Spanish to the highlands. While there is probably some truth to this, still there is more in that the dance seems to have origins long before the coming of Africans with the Spanish. It has its origins in the area of the great Tiwanaku civilization that antedated the Incas and lasted for more than a millennia. The morenos are chthonic figures who come from outside the towns and enter in like the ancestors, the Achachilanaka, as the contemporary Aymara call the mountain deities the Quechua call Apus. Though this dance culture developed historically on both sides of Lake Titicaca, from long before the area was divided between Bolivia and Peru. Most recently, though, it has developed as a strongly urban culture, centered in the city of La Paz and Oruro in Bolivia, and only then in Puno, in Peru. 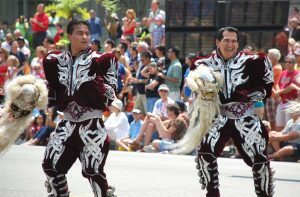 As it has moved and grown, claiming adepts, it has pushed out numerous more indigenous dance traditions to where these two, in combination with the modern Caporal (this one a modern creation whose roots go to Bolivia’s Yungas, the eastern slopes of the Andes, and which consciously represents the overseers of African workers, the hyper masculine and aggressive caporales of its name) have become the holy trinity of cultural self-representation of the altiplano, the high plateau around Lake Titicaca. One sees these dances in Cuzco, to the frustration of traditionalists, embodied by local youths as well as immigrants from the altiplano. Of course, this borrowing from the highlands is nothing new. Cuzco has a long history of relationship with the Lake and its peoples. If nothing else it is marked in the story of the first Inca, Manco Capac and his consort Mama Ocllo, coming to Cusco from the Island of the Sun in the Lake. Besides this, there is the history of representing the pastoralists of the altiplano as in Qapac Colla, the Great Colla dance widely performed around Cuzco. This frustration of Cuzco’s traditionalists and defenders of culture at the growth of altiplano culture in their midst is one point of controversy. Another, and the far more virulent one, is between Peru and Bolivia. With the recent, successful, nomination of the feast of the Virgin of Candelaria before UNESCO to be listed as Intangible Human Heritage the tensions grew hot and fierce. Bolivia raised protests at what it sees as “theft” of its culture by its neighbor. In fact, the nomination only advanced when the two countries came to an understanding and recognition. Nevertheless, Bolivians remain frustrated at what they see as “typical” of themselves, something that represents their heart and soul as a people, being claimed as “typical” in a neighboring country, a claim they see UNESCO now supporting. This conflict is about what the dances symbolize, the nation state and people. It is about ownership and the importance of developing trademarks, a kind of cultural coinage. Yet that is only part of a complex history of exchange and movement back and forth across the altiplano. Today Bolivian bands which perform Morenadas, many of which are justifiably famous, are in great demand to perform in Puno’s festivities. At the same time, trarkha flute bands and others from Peru’s side of Lake Titicaca travel to Bolivia to perform as accompaniment to local dance troupes and to perform in fiestas. There is a long standing exchange of people and cultural forms around the lake. The carry marking, a kind of fixed representation, at the same time they develop new organization and meanings as they travel. Both the political and cultural conflicts, as well as the outrage and long term exchange are bound to continue as both sides of the Lake recognize the value of promoting folk culture and of attempting to brand it as their own. Your article is very biased; it could not more apparent. Do you not think if us Bolivians claimed Brazilian Samba, they would not immediately call us out? Of course they would and with good reason. These dances are not about attracting tourist or even branding; no sir these dances are about showing devotion to the deities we love and rely on to give us strength to live our lives. My family has had their own group in La Paz, Bolivia for generations so dancing has been a huge part of my family’s history. It is only a recent trend that Peruvians have been dancing our dances to attract tourist and use in their festivals, might I add using our popular music by Bolivian artist. You could not understand the pain one feels when, so many foreigners think we are being petty for defending what is ours. No we are not saying no one should ever dance our dances, what we want is for people to understand that these dances are Bolivian, they morphed into what they are today by Bolivians, and they deserve respect. The shameful representation done by Peruvians may be okay with you, but sir not to me. I dance these dances in the bay area in California with a dance troop, I dance them and they are represented as Bolivian by us; even the Peruvians in my group do not question that the dances are Bolivian. So before you go rambling about your superior knowledge about two countries and their culture, and about Bolivians being asinine with their claims, think twice because your offending an entire country and its people. 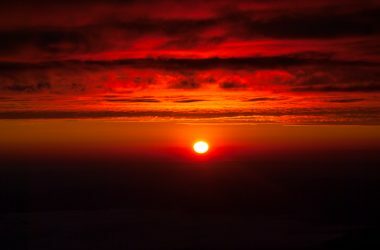 Good morning M. Thank you for your comment and my apologies for offending you and probably many other Bolivianos, without any intention of doing so. Nevertheless, I am aware of how difficult and offensive this issue can become, certainly after living with Bolivians and in Bolivia for many decades. But the issue is not simply one of national identity. The problem lies in the fact that the culture is altiplánica, whose historical urban development is in Bolivia, as the article notes. In that sense your argument about Samba does not work. I do not know if you have been to Puno for one of its fiestas, especially twenty or more years ago. If so you would get the deep ties it has with Bolivia which go back for thousands of years, long before there was a Bolivia. It is part of the same Kollasuyo as Bolivia. Neither you nor I can deny that. Where you do raise a good issue is in the appropriation of that by Limeños who then call it Peruvian without recognizing the depth of ties with Bolivia, including the constant reliance on Bolivian artists as you state. I do mention that in the article. I am sorry you think I am claiming some “superiority”. Al contrario. I am pleased to walk hand in hand with compañeros Bolivianos y Peruanos. I will always be thankful for the many courtesies and kindnesses I have received in both countries from both peoples who are descendants of the great Tawantinsuyo. I would love to see you dance in California and am proud you do. My best to you and your colleagues.